After taking exactly one bite of the pickled peaches I’d made last month, my little foodie Edie declared we needed a pie made of pickled peaches. This weekend I accommodated that request. That girl of mine is onto something. Combined with ice cream (for dessert) and yogurt (for breakfast), pickled peach pie is the way to go, if you can stop yourself from eating the jar of pickled peaches. After her first bite of pie, she informed me, we’re gonna need more of these, so I guess I’m going to head out this week and get another half bushel or so of peaches to pickle, because we have managed to eat almost half of the two batches I put up just a few weeks ago. Pickled peaches have the consistency of canned peaches – that is, soft. Where the pickling comes into play is the taste. They have a bit of a tang to them from the vinegar, a bit of spice to them thanks to the ginger and cinnamon and the natural sweetness of a peach. They are, as has been said around here, ‘dang good’. I used the recipe from The Serious Eats website in pickling them. The only variation I did to the recipe was to grate the ginger rather than slicing it. As I noted in my post when I made them, I had a good bit of brine left over – enough to get at least double, if not triple what the original recipe called for. Which clearly, is a good thing. I did a tutorial on making a pie crust a while back for our friend Bea who is living in England, but realized I didn’t include the recipe at the time (I had sent it to her previously), so to correct that, here’s my pie crust recipe. It’s based on the recipe my mother handed down that I’ve tweaked slightly. 3/4 cup butter (or crisco or lard or a blend of shortenings), cold. 6-7 tablespoons ice cold water with a dash of vanilla. Let the dough rest in the refrigerator while preparing the filling. Even just a few minutes helps when you roll it out. The colder the dough is, the easier it is to roll out. I roll out my pie crust between two layers of wax paper. I pull one layer off, lay my crust down in the pan (or on top of the filling) and then gently peel the second layer off. 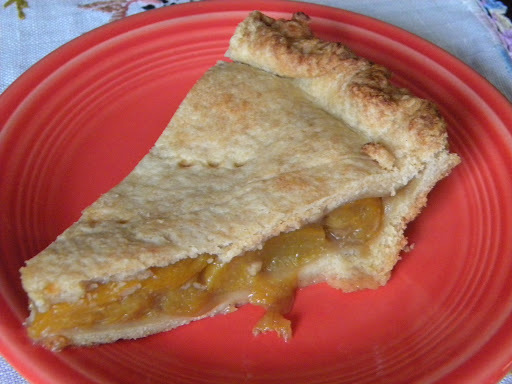 To make pickled peach pie, I drained two and a half pint jars, tossed them with a sprinkle of sugar and about a 1/4 cup or so of flour, similar to the recipe for a regular peach pie. I followed the baking instructions for standard peach pie – my method is to bake at 425 for 15 minutes, then turn the oven down to 350 for 35 minutes or so. A note about pie pans- I use only vintage Wear-Ever aluminum pans. I have tried many different pie pans over the years and aluminium pans are the way to go. It results in a much nicer bottom crust than any other pan and is what commercial bakeries use. That sounds like pure Southern cooking awesomeness.